Posted on 04.27.10 by Steven. With reports coming out that the Raiders may be parting with QB JaMarcus Russell, we just had to say good-bye. Where will this Class A Jackass end up? Or will he tour the country with his best friend T.O and solve murder mysteries? This video is hilarious! listen t what Mel Keiper has to say, just couldnt have been more wrong! They shouldn’t cut him. He should be forced to do something for the team. You can’t do nothing for 3 years and walk away with near on $50m. Make him wash some car’s or be the drinks boy or sell hot dogs…….well may be not sell hot dogs looking at the size of him. 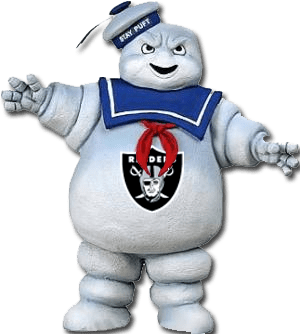 Judging by his arms I say the Stay Puft Marshmallow Man probably has the same range of motion as JaMarcus.